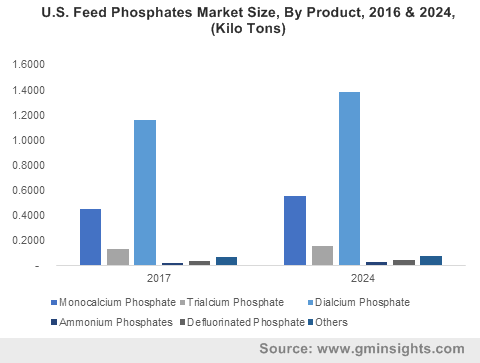 Feed Phosphate Market size was over USD 3.5 Billion in 2017 and industry expects consumption above 11 million tons by 2024. Rise in consumer demand for quality meat and meat products owing to changing lifestyle patterns and increasing disposable income will drive the market demand. These products contain high content of calcium and phosphorous which is highly recommended for proper growth and maintenance of livestock. Additionally, the product improves the nutritional quality and enhances the digestion of livestock thereby enhancing feed phosphate market demand. Phosphates are derived from phosphate rock and is considered as an essential nutrient for effective performance of various functions including growth, repair, lactation and reproduction. These products are incorporated into the diets of animals and are mixed with commercial animal food such as fodder and other premixes for the effective results. These products promote better heath and prevents diseases including rickets during the poultry production. High prevalence of animal diseases owing to improper diet and lack of essential nutrients in the body will drive the market growth. High economic growth accompanied with consumer willingness to spend on quality meat products such as pork, poultry and beef owing to high content of protein, vitamins and minerals is promoting the usage of meat consumption mainly in Asia Pacific region. Growing consumer preferences of youth population towards non-vegetarian diet in India, Indonesia and China will support the market growth. China is the largest pork producer in world, producing nearly half of the world’s pork which accounts and is expected to produce over 90 million tons by 2022. Also, rising demand for processed meat products which are generally beef, chicken and pork based, owing to hectic schedule of consumers are expected to drive the market growth. Phosphoric acid and phosphate rock is used in the production of feed phosphates. The lack of phosphorus in animal’s diet can lead to poor feed conversion, reduced growth rate of milk production, bone malformation and the threat of causing rickets. Sufficient supply of phosphorous in essential for conducting necessary body function in animals. For instance, lactating dairy cows requires a minimum of 71g of phosphorous in their daily diet during growth or pregnancy along with the amount of P secreted in the milk. Calcium and phosphorous supplementation is necessary mainly in the diets of poultry and swine since common animal food ingredients contains low concentrations of calcium. A typical corn-soybean meal contributes to only about 16 percent of the total calcium for growing pigs. Feed phosphates acts as substitutes or additives thereby providing supportive functions including development of skeletal tissues, protein synthesis, energy utilization and transfer, along with maintenance of osmotic pressure and acid base balance. All these superior properties are expected to stimulate the global market size. Favorable government regulations regarding animal husbandry and high nutrient requirement for livestock production will drive the market growth. Growing consumer awareness regarding the animal health along with providing them with adequate nutrition will further accelerate the market growth. Feed phosphate market size from monocalcium phosphate should expect growth rate close to 3% by the end of forecast period. The high content of calcium contained in the monocalcium phosphates enhances functions such as digestibility of substances, normal functioning of nerves, muscle and heart, skeletal development and formation of strong bones. MCP’s added to premixes fosters weight gain in poultry and livestock by approximately 5-12%. The products are generally expensive due to limited availability of phosphorus in nature. The increasing usage of enzymes including phytase as substitute of feed phosphate products are expected to hamper market growth. However, with high technological advancements along with strong investments in R&D, the manufacturing of these products at lower costs is possible providing major opportunities in the feed phosphate industry. Feed phosphate market size from tricalcium phosphate should expect gains at over 2.5% by the end of forecast period. TCP products utilized in the animal food mainly for pet food enhances biological activity, muscle contractions, blood clotting and nerve impulse transmission. Feed phosphate market size from poultry livestock may register significance gains at above 3% over the forecast period. Products such as MCP and DCP are used as supplements for improving efficiency, performance, laying capacity, feed utilization along with maximizing meat and egg production. Cattle livestock in the feed phosphate market should surpass USD 1 Billion by the end of forecast period. Phosphorous requirements of cattle vary depending on the stage of age, reproduction and peak milk production. The deficiency of phosphorus in beef cows lead to bone fractures and rough hair coat. These products provide increased appetite, animal food efficiency, milk production and conception rates. Europe market driven by Germany, UK and France should expect consumption at over 1 million ton by 2024. 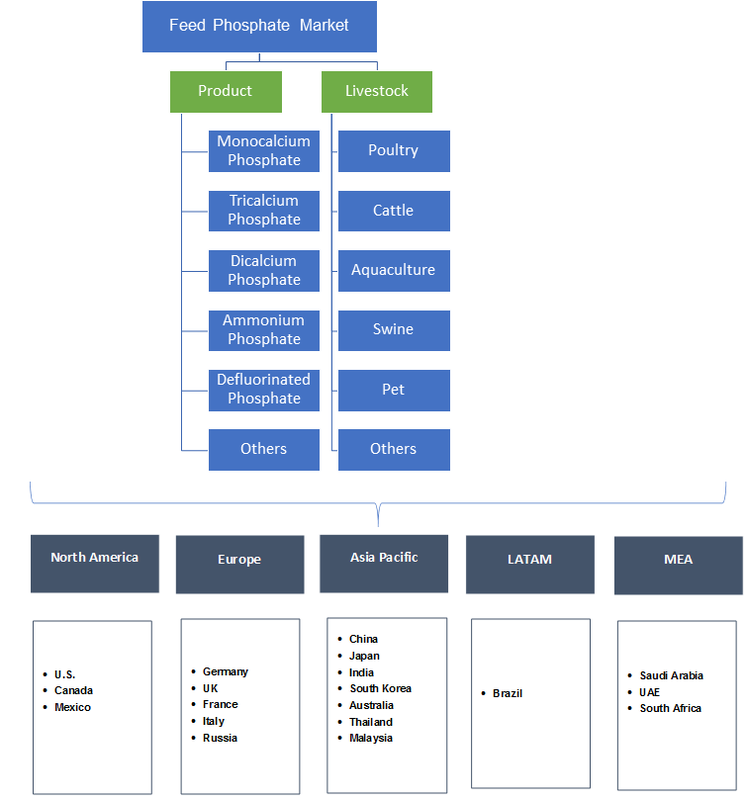 Growing consumer preferences towards pork and poultry products owing to changing lifestyle patterns and consumption of processed products will positively influence feed phosphate market demand. The average person in the EU consumed approximately 41 kg of pig meat in 2016 and the exports are increasing at alarming rates, with the self-sufficiency rate increasing from 110 to 112 percent. Asia Pacific market driven by China, India and Japan should register significant gains above 3% over the projected period. Meat consumption is highly linked to higher incomes and as a shift, the food consumption of animal protein sources is likely to increase. Increase in GDP and rising disposable incomes, people are preferring pork, poultry and beef products in their daily lives. The population in this region will account for over 59 percent of global population by the end of 2020 out of which 54% population is expected to be middle-class. Feed phosphate market share is moderately fragmented with major industry players such as PhosAgro, Mosaic, PotashCorp, OCP Group, Eurochem, Elixir Group and Yara International. Manufacturing companies are focusing on decreasing the overall products costs owing to cheaper availability of cheaper substitutes. Companies are highly engaged in forming joint ventures and partnerships to enhance their regional presence and product offerings which further stimulates feed phosphate industry growth. The products are manufactured by reacting phosphoric acid with other elements including sodium carbonate to ensure essential supply of nutrients in livestock. These products are rich source of calcium and phosphorous and extensively used by the animal feed industry mainly for meat production. These products are majorly utilized by the poultry, swine, cattle, aquaculture and pet food industries. Rising awareness for enhancing the overall growth and maintenance of animals is expected to accelerate feed phosphate industry demand.